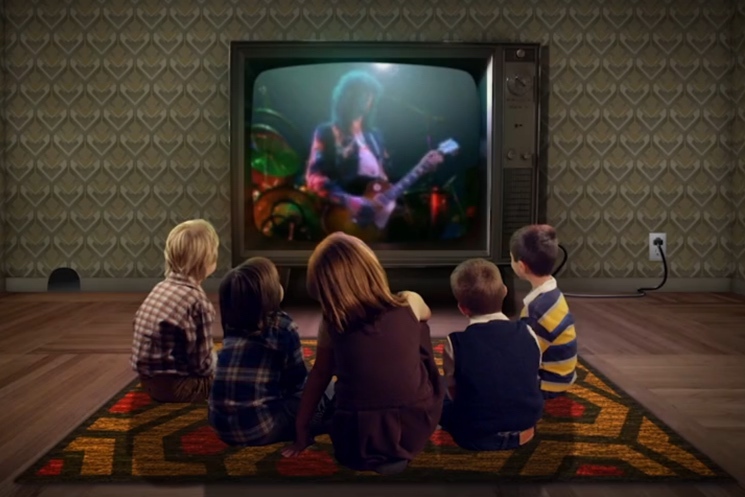 Last month, classic rock arena gods Led Zeppelin reissued their classic 1975 album Physical Graffiti in expanded form, and now one of that re-release's bonus cuts, "Brandy & Coke" — an initial rough version of "Trampled Under Foot" — has gotten an interactive video. The video takes us on a room-by-room tour of the building seen on the Physical Graffiti album cover, as viewers can click on each window to see what's going on inside. With the rocking blues jam as a soundtrack, we see that the rooms almost all have a Led Zep theme, be it some kids watching the band perform on TV, a woman with music posters all over her walls, a youngster performing an energetic routine with a toy mic, or a blimp with speakers in the side. Get in on the fun below. It comes from the interactive video company Interlude.